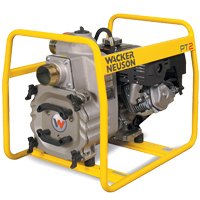 Wacker centrifugal trash pumps have proven themselves on jobsites around the world. With an optimized impeller design and built-in contractor friendly features, this line of trash pumps has redefined the quality and durability standards of self-priming centrifugal trash pumps. 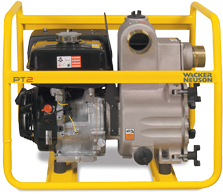 The PT 2 series of centrifugal trash pumps are reliable dewatering tools for a variety of applications. The lightweight pumps can handle up to 210 gpm (795 l/m) and solids up to one inch (25 mm) and are ideal for general dewatering of excavations, flooded basements, manholes, utility vaults, mining work, swimming pools, lakes and barge holds or wherever there is unwanted water. With the radial flow design and built-in contractor friendly features, this line of trash pumps has redefined the quality and durability standards of self-priming, centrifugal trash pumps.